We have been busy transforming Patches into a winter wonderland. Got a bit more to do, but it’s something I’ve always loved doing. When I was growing up, I was the one meticulously putting tinsel on the tree, one-by-one! It had to be just right! This year, I brought my entire Snow Village collection to Patches. Not only does it look great, but it makes me feel wonderful. I hope you get the same satisfaction when you come to Patches this holiday season. 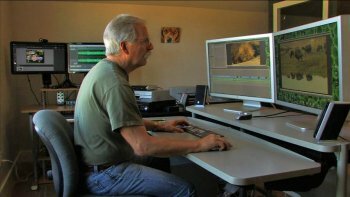 This weekend, John will be filming our staff and producing another fun Christmas music video. This year’s song will be Holly Jolly Christmas (Patches rendition). We will let you know when it is available for viewing on our website. For those of you living out of town, we have some upcoming website specials just for you. It’s a 4-Day Blowout Special to celebrate Black Friday, Shop Small Saturday, Sexxy Sunday, and Cyber Monday. Here’s how it works. 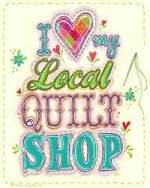 During these four days, you will receive 20% OFF ALL website purchases you make at PatchworkQuiltsHamilton.com. This discount applies to everything on our website, including clearance and special items. To receive this discount, you must enter the Promo Code (SANTAROCKS) during the checkout process. Remember too, Patches has FREE domestic shipping on domestic orders over $50. 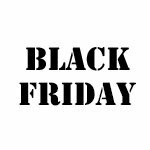 For our local customers, we are having a Black Friday/Shop Local SALE this Friday & Saturday (27th & 28th). 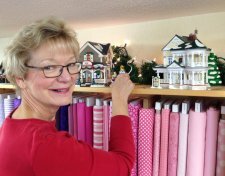 This sale is to help you finish up projects before Christmas. In such, ALL Christmas fabric & accessories (patterns, books, decorations, etc.) will be 25% OFF. In addition, ALL Backing (3-yd minimum) and wideback fabric (NO minimum) will be 15% OFF. New this season! Our 12 Days of Christmas SALE will start on Tuesday, December 8th and go through Saturday, December 19th. On each of these days we will feature a Christmas gift ON SALE. More details about this event will be coming soon. If you haven’t already done so, please pick up a Holiday Shopping Wish List today. 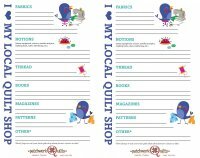 You can print them out on our website (on the left side of the Home Page, just above Today’s Montana Photo) or pick one up from our shop. We encourage you to fill them out with your special wishes. Once you have, give them to your Santa (spouse, significant other, relative). They will receive 15% OFF any gifts listed as well as FREE gift wrapping. 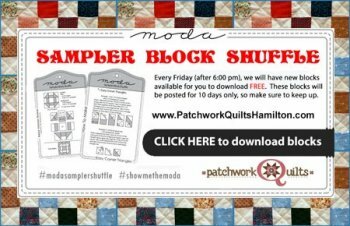 To view all the beautiful quilt blocks our customers are making for our Moda Sampler Block Shuffle, just clock on the image above. Great job ladies!